I must have listened to the new House Of Lords release 'Come To My Kingdom' five or six times now. I am thoroughly impressed with this work. Frontman and phenomenal vocalist James Christian has pulled out all the stops on this album: great lyrics, melody, guitar riffs, and an impressive rhythm section. We all remember the unusual (a merciful description) 'The Power And The Myth' which brought HOL back to our ears. Then Mr. Christian and company returned to their early arena rock roots with 'World Upside Down' and we were all more than a little bit relieved. Now 'Come To My Kingdom' seals the deal: this is great melodic hard rock, probably the best I've heard so far this year. Nearly perfect in scope, every song is a gem. There are great rock numbers like the title track 'Come To My Kingdom,' 'In A Perfect World, 'In The Light,' and 'One Foot In The Dark,' with its great opening bass line and continous throbbing rhythm. Additionally, there are moving and, often, more than a little raucous ballads like 'Another Day From Heaven,' 'The Dream,' a simply stunning example of Christian's fine vocal talent, great composition, and fine musicianship, and 'I Believe.' These are only seven highlights from a work filled with melodic rock assertiveness. Again, the whole work is simply sonically stunning and very enjoyable. Additionally, they received some help from Gregg Giuffria and the album was mixed by none other than Dennis Ward. 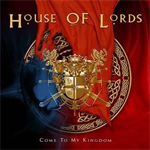 'Come To My Kingdom' is easily House Of Lord's best work since their debut in 1988. Highly recommended! James Christian and House Of Lords are back with the stunning work, 'Come To My Kingdom,' a marvelous album of energetic and diverse melodic hard rock. This is some of the best of the best!